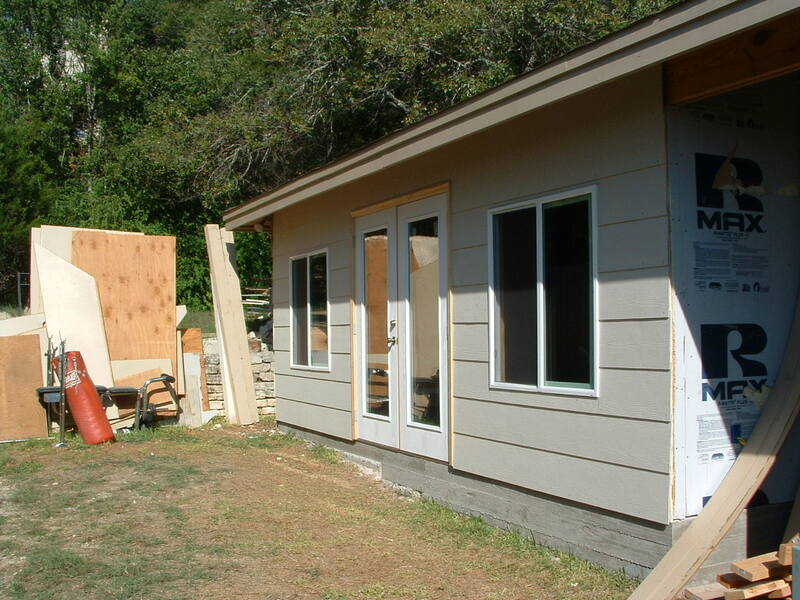 We did not work on Saturday…but hit it hard on Sunday and got the construction done! Ironically, within a few hours of finishing I got an email from a friend who does built-ins and he’s ready to start. What timing! 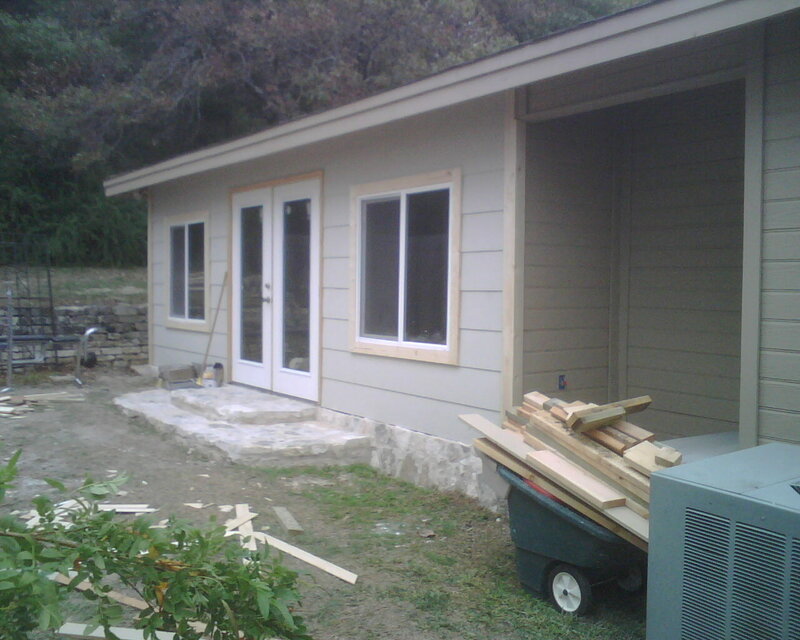 So, we’ll hold off painting inside until the built-ins are done but the outside is ready for caulk and paint. I’m real happy with the interior finish out as well. The base boards and door trims went in without a hitch. It is remarkable the difference between my work (I did the baseboards) and Tom’s work (he did the door frames and windows). Let’s just say that mine will need A LOT more caulk than his! His joints are so tight I’m not even sure they need caulk! 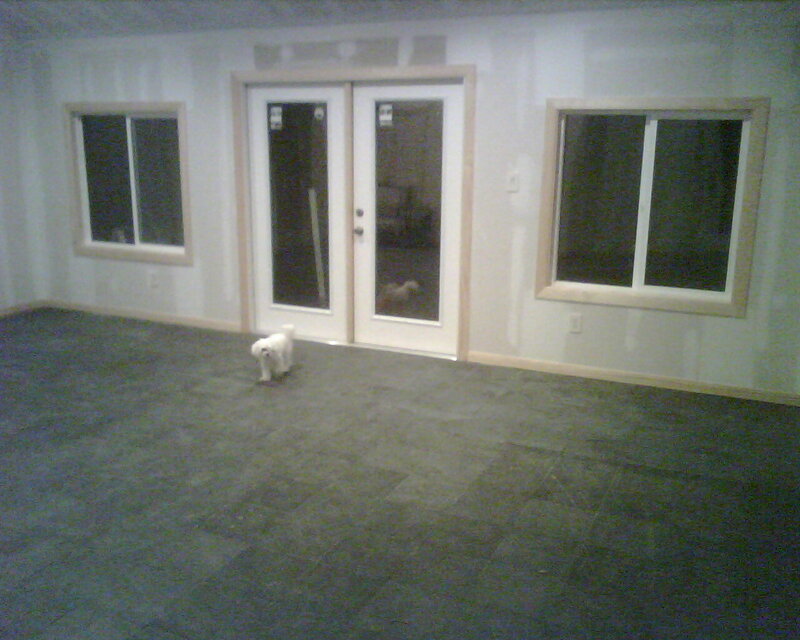 We also went with a black slate on the floor. We’re working on wall/trim colors now. The end is in sight! 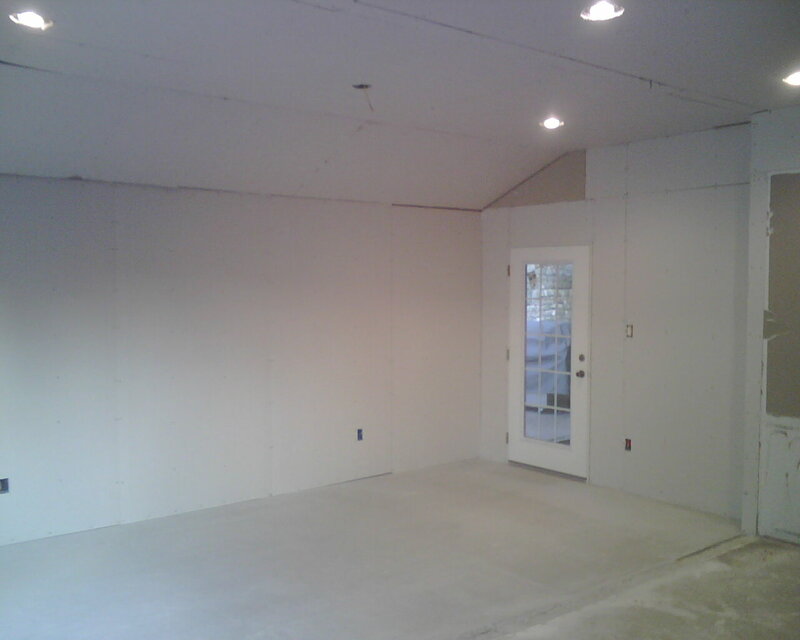 Sheetrock done…bring on the outsourcers! 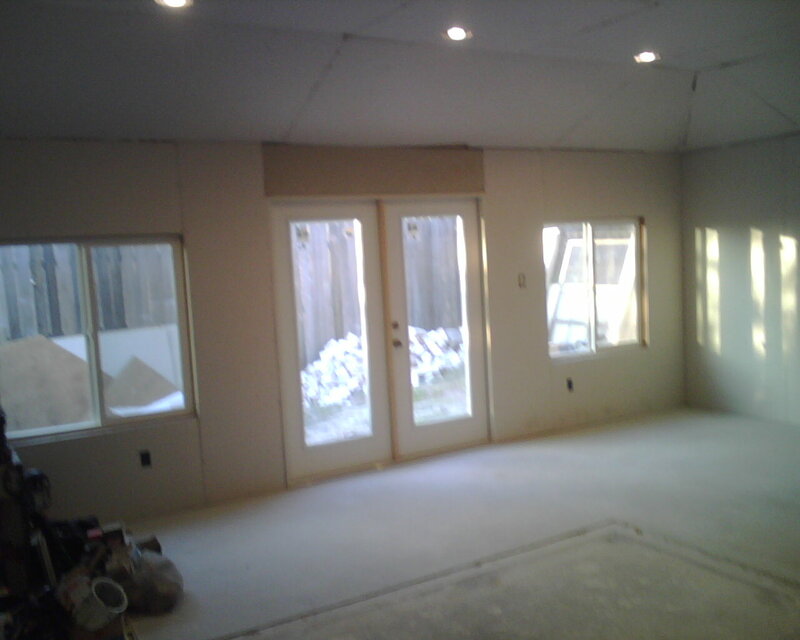 After a one week delay (on me), the sheetrock is finally complete. I tinkered around on it a few nights after work and devoted this entire Sunday to it. It took longer than I thought but looks great! 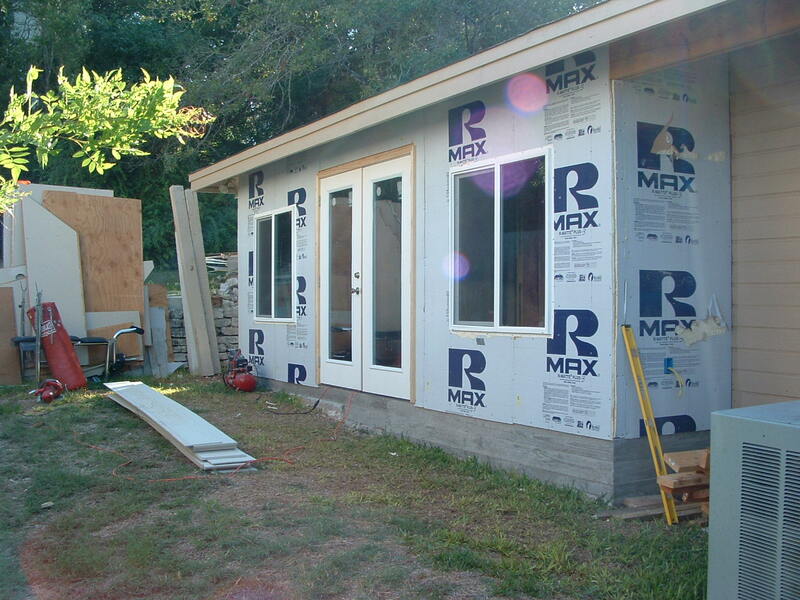 You may notice that the piece of sheetrock above the door is a little different than the rest. I ran short of rock and just before I headed out to Lowes I remembered that I had a piece down in the garage from a past project. By past I mean probably 5 plus years ago! The tape/float/texture guy is coming this morning. The electrician is coming back for a final time Wednesday. I’m off to find a tile guy (and some tile) today. I had originally hoped to be done by halloween…and it looks like I’ll miss it by a couple of weeks. Not bad all things considered. The interior (old) walls have been removed. 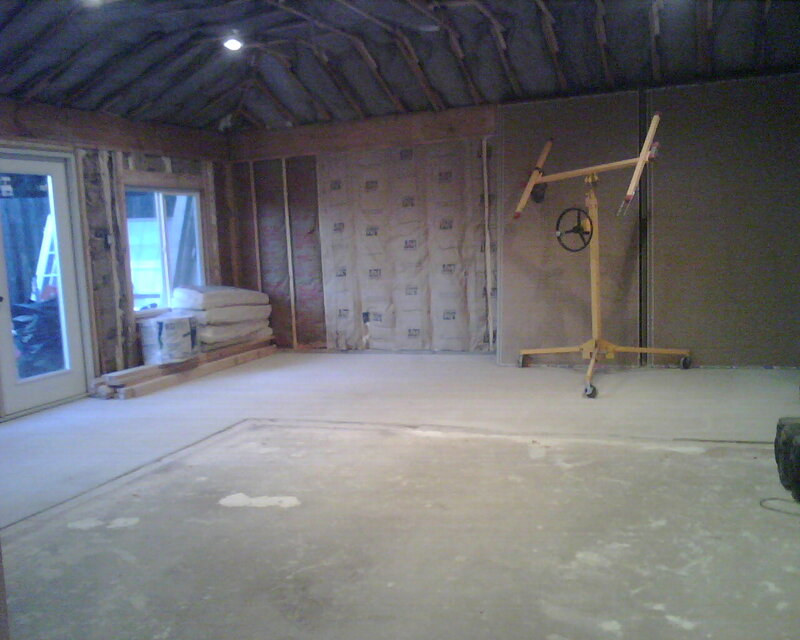 The line on the slab gives you a good idea of the scale of the room before and after. 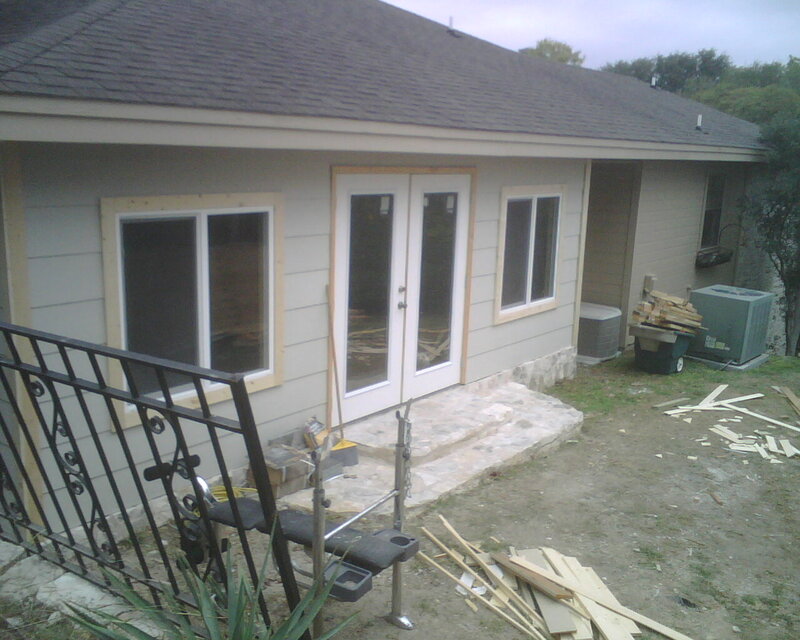 Once those three things are done we’ll be back to add baseboards, door trim, and finish the exterior trim. I haven’t decided whether I’ll hire a painter or do it myself (inside and outside). It depends on the weather and the draw of the woods as rifle season is just around the corner. More progress on the gameroom! 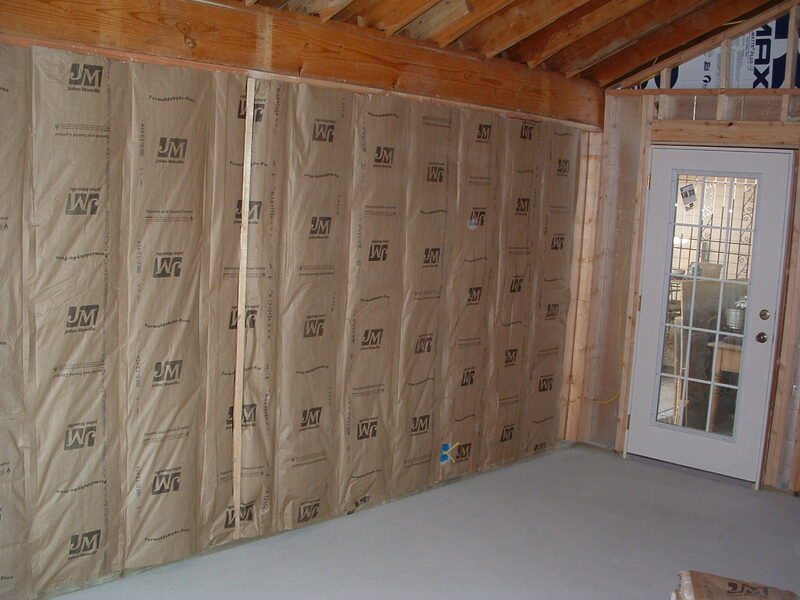 We even worked on the inside a little…running all the electric and starting on the insulation. I continue to be amazed at both the quantity and quality of work my b-in-l, Tom, is doing! It looks like we’re settling into an every other weekend pace. I will tinker a little during the week doing what I can do without setting the project back two days for every day of “work” I do. 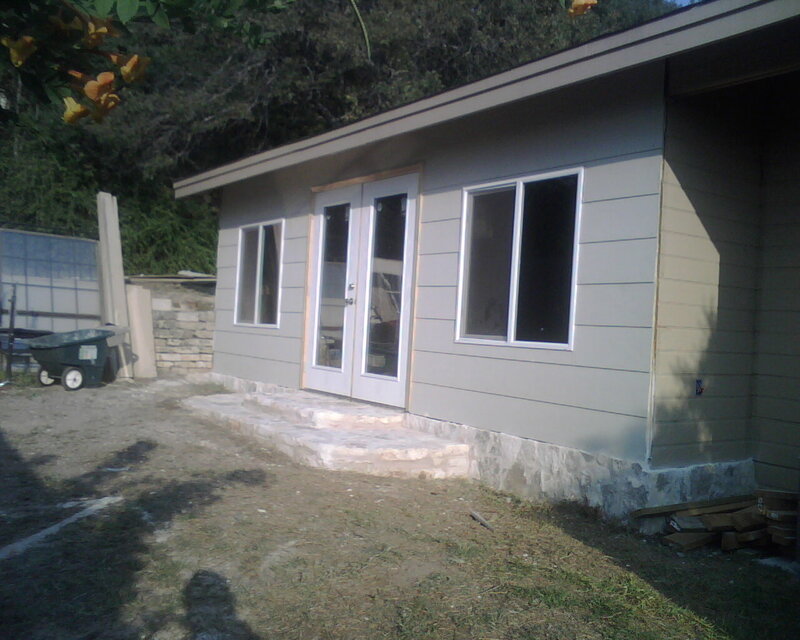 And this…we’ll call progress (after just one weekend of work not counting the slab)! After the marathon this coming weekend…we’ll be right back after it the following weekend! I plan to take more pictures from the same perspective as we progress. On the first day of summer 2008, Bailey and I left Austin en route to Arizona (via Las Vegas, NV) for 6 days of whitewater rafting on the Colorado River in the Grand Canyon. We spent all day Saturday making our way to Marble Canyon, AZ for an overnighter in preparation of hitting the water first thing Sunday morning. The logistics of this trip were overwhelming to say the least. The Grand Canyon is not an easy place to get in or out of. 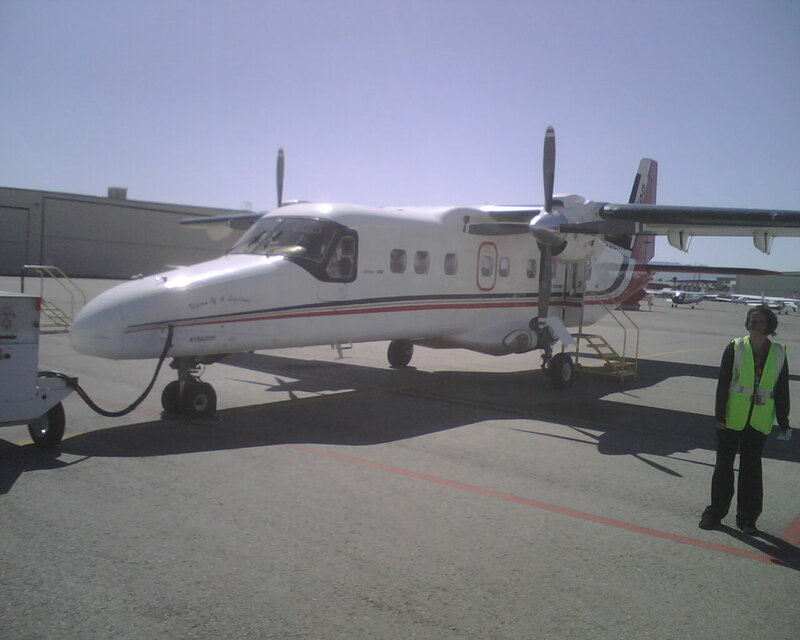 We flew the “bus” (Southwest) to LV, took a shuttle to the North Las Vegas Airport, caught a Vision Airlines flight to Marble Canyon (can you say tiny plane? ), and caught a second shuttle (provided by the river outfitters) to Cliff Dwellers Lodge. The lodge was about what you’d expect for a tiny, desert town and made for a good nights sleep…our last in civilization for the next six. The restaurant next door was a huge surprise on the upside. We woke up early to get organized before meeting the shuttle to Lee’s Ferry for the start of the wet part of our adventure. Upon arrival, we got our first glimpse of the awesome machines that would be our sole means of transport for the next several days. The rafts were huge, around 30 feet long with pontoon-like side tubes down both sides…covering about 1/2 of the length of the main raft. The pontoons did not extend out from the boat (catamaran style) but were tethered tightly to the sides using straps, rings, and carabineers. I quickly decided that, if legal, I would be riding on front of the left pontoon for the duration. Bailey could ride wherever he was comfortable without input/pressure from me. On top of the main raft is an aluminum super-structure that has submerged storage (for cooking gear and whatnot) as well as rider level storage for things that you might need access to during the day (coolers, water, Gatorade, day pack). The tail end of the structure housed a square area known as the “tearoom”. This is the driest and safest part of the boat. Directly behind the tearoom is the cockpit. This is command central where the boatman steers the raft using a 30 hp Honda outboard with a long handle…so that it can be operated while standing. After locating and fitting a good lifejacket (which can never be off as long as you’re on the boat) we met our guides…Jeff, Don, and Jack (the swamper). Jeff was the most senior guide (28 years on the river) and, therefore, our trip leader. Don had 15 years experience. Jack was on his 28th trip down the river…6 as a passenger and 22 as a swamper. We chose Don’s boat, number 6. There were 15 total passengers on boat 6 and 14 on boat 10. The guides stayed with their boat and the swamper switched back and forth. By 10 am we were “backs to boards” heading west…and the pontoons WERE legal seats! It didn’t take long to figure out that water let out of Lake Powell (impounded by Glen Canyon Dam) is around 48 degrees. It doesn’t warm up much during the 187 miles we’d be covering (about 1 degree per 10 miles). It’s a rather odd sensation being in dry, 100 degree desert air and then getting blasted in the face by water somewhere in the 50 degree range. I found it quite awesome, Bailey was 50/50. After an hour or so we pulled over for our first lunch of cold cuts. Lunch was the same every day with minor differences in the meats available and the occasional addition of leftovers from the previous evening’s meal. There was always lettuce, tomato, sprouts, and cheeses. Chips and cookies accompanied. We put in a total of 29 miles and docked for our first night of sleeping on the water’s edge at a spot called Shinumo Wash. Camp is always set up on a sandbar where a side canyon dumps into the main canyon. This dumping allows sand to accumulate and gives campers the opportunity to sleep on sand as opposed to rock. This first evening we also learned our routine of packing/unpacking the raft. This was a very good exercise in cooperation and almost everyone participated. We would form a long line from the front of the boat to a central spot on the “island”. Once formed, we would unload the chairs, tents, night bags, and pumpkins (large, orange, waterproof sleep kits). Once both boats were emptied of that gear we would form two shorter lines from the front of each boat to the kitchen area and unload the cooking gear. This consisted of pots, pans, stoves, cookers, coffee pots, plate packs, utensils, and propane.Finally, we would pull off several galvanized buckets, dip them in the river, and bucket brigade them to the kitchen area. Four of the buckets are then boiled for washing/rinsing dishes in hot water. Once everything was off the rafts the guides would set up a “Mr. Stinky” on both sides of the island (reasonably hidden), along with a hand washing station at each which included an orange flotation cushion. 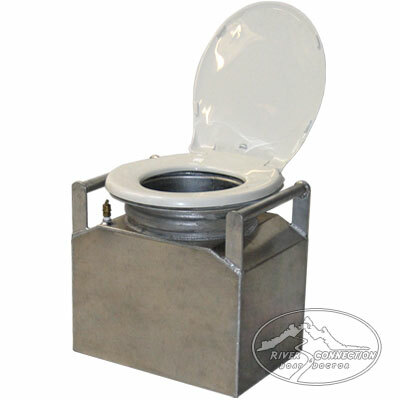 Mr. Stinky is a metal container approximately 20 inches tall, 24 inches wide, and 8 inches across. It has a sealed ring metal lid while in transit and a toilet seat/lid when stationary. When in use, the user takes the orange cushion from the hand washing area to alert other would be users that it was currently occupied. When done the user takes the orange cushion back to the hand washing station indicating that Mr. Stinky is available. There is no peeing in Mr. Stinky. All peeing MUST be done in the river. No peeing on sand, rocks, bushes, etc…ONLY IN THE RIVER. This goes for males and females alike. While Don went about preparing dinner, Jeff and Jack took a small group of us on a short hike/swim up Shinumo Wash to Silver Grotto. There were a few fairly challenging boulder crossings/climbs, a few short swims in brackish standing water, and one rope assisted climb up a dryish waterfall. Nibbles were served shortly after our return. Nibbles were served nightly about 30 to 45 minutes before dinner and typically consisted of cheese, crackers, artichoke hearts, and smoked oysters. Steak was the main course accompanied by a zucchini/squash medley and some sort of potato. No one went hungry…unless it was by choice. It gets dark around 8 o’clock in the canyon…so, after a quick game of cards, we set up our tent and sleeping area and called it a night. As a fine accompaniment to the 8 pm sleep time, dawn in the canyon greets you at around 4:30 am. It is light enough to read without artificial light by 5 am.Fortunately coffee is ready by 5:15ish. My morning routine was pretty well established by the first river morning. Rise just before 5, brush teeth, increase the flow of the river (always in that order! 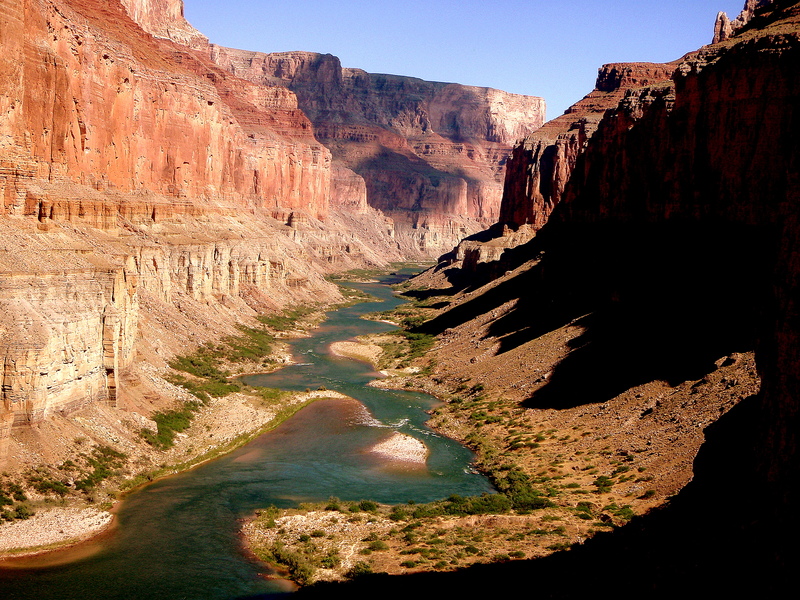 ), find a secluded spot to bathe (50 degree water be damned…I can’t go a day without being at least somewhat clean), break down my sleep area, get coffee, sit down and watch the sun come up over the canyon rim. When it looked like breakfast was almost ready I would give Bailey his first nudge and start putting away his sleep gear. Once he was up we would eat, break down the tent, and put away the chairs. The final personal item of each morning would be to pack up our night bag and day bag and join the duffle line to repack the gear into the rafts. We were usually on the water around 7:30 every morning studying our “waterproof” river guide to see what the day held. This morning brought the viewing of Stanton’s Cave, Vasey’s Paradise, and the Redwall Cavern…where we stopped to stretch and play Frisbee (Jack, the swamper, can really hum a Frisbee). 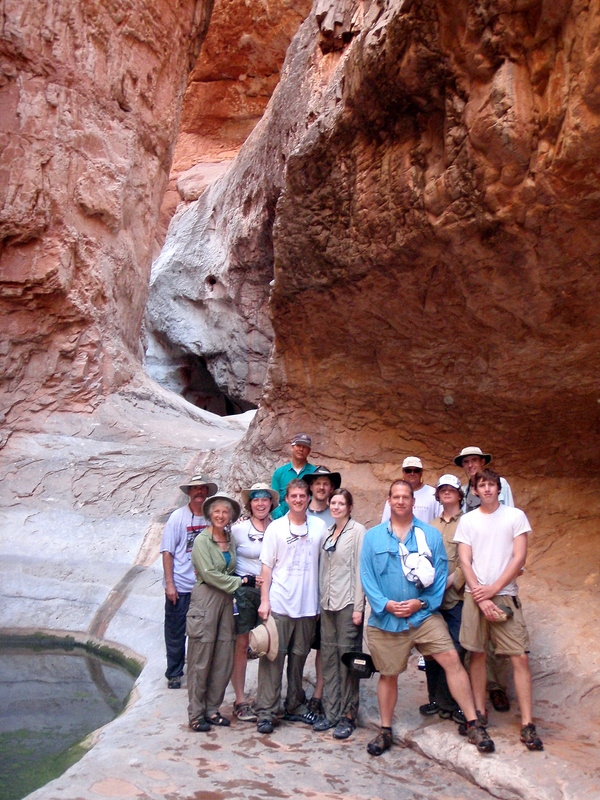 We stopped a few miles later and hiked up Nautiloid Canyon to look at the prehistoric creatures frozen in the rock. 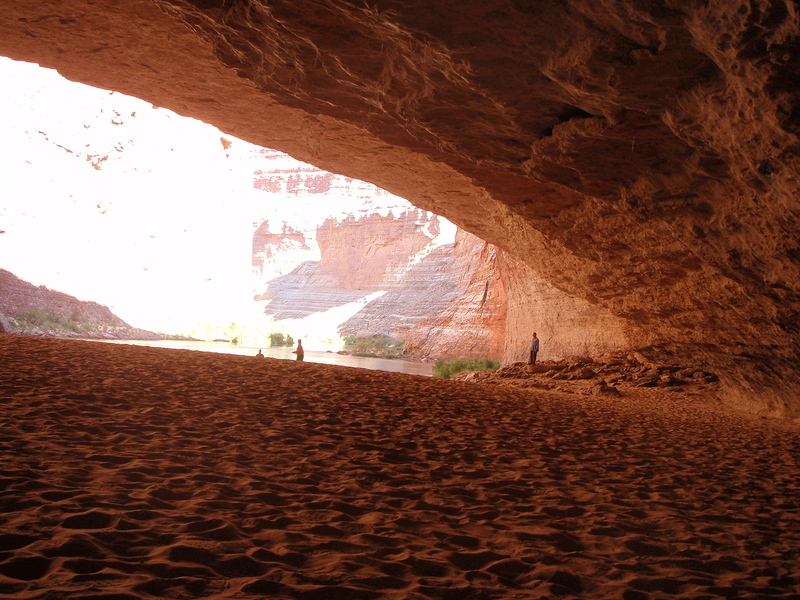 Early afternoon had us pulling into Nankoweap Canyon…a good stopping point for day 2. Here we had our first big hike. A small group of us scaled the canyon to get a look at some old Puebloan granaries. The natives built these about 900 years ago to store grains where they would be somewhat safe from rodents/bugs/weather/other natives. We learned that they basically farmed by planting seed as they passed through and hoped that they got enough (but not too much) rain so that there would be a crop when they returned several months later. The view from up there was quite awesome…I understand it is one of the most photographed spots at the canyon. After a quick dinner of grilled chicken breast we played some cards and hit the sack. According to our guides, days 3 & 4 would contain the most whitewater…and they did not disappoint! We started the day with Kwagunt, followed by a nice hike up the Little Colorado River for some swimming in moderately cool (70 degree) water. 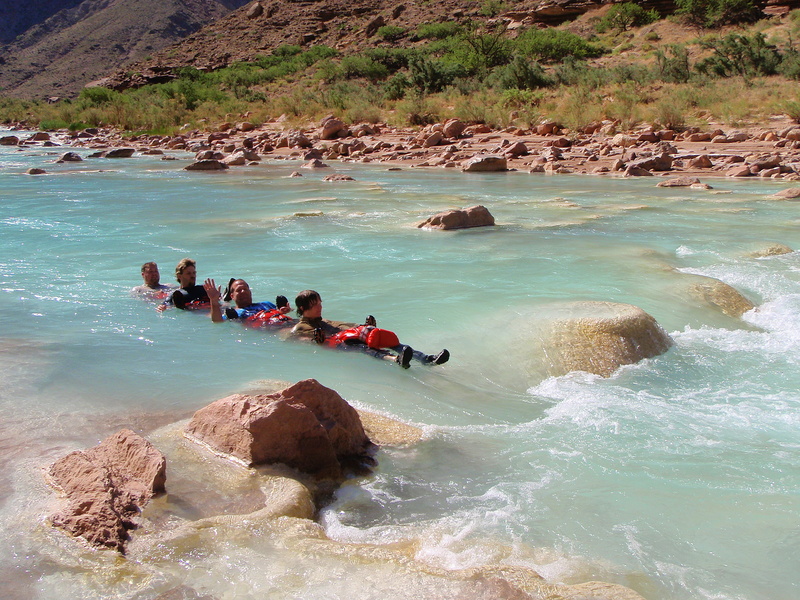 Here we learned to invert our life jackets (diaper style) and form a human chain (ankles to pits) to “ride” the small rapids of the turquoise colored side stream. Here we also learned that there is no soap in the side streams…so bathing in the moderately cool water wasn’t an option (at least not with soap and/or shampoo). Bummer. After Little Colorado, we start to really get into some good rapids; Lava Canyon, Tanner, Unkar, Nevills, Hance, Sockdolager, Grapevine, and Zoroaster…and that was just miles 62 to 85! 23 miles of pure excitement!! Just short of mile 88 we pull up on the beach at Phantom Ranch. This is the closest thing to civilization we’d seen since Sunday and the last we’d see until Saturday. About a 20 minute hike up a donkey trail gets you to the cantina. They serve beer, tea, and lemonade to the campers who are staying on site and the rafters who are passing through. Bailey and I took the opportunity to touch base with Kel via payphone (collect call), use a “flush” toilet, and have some cold drinks with ice!! Somehow (against the rules of the establishment) several Tecates made their way back to our boat. We got back on the river, blasted through Pipe Springs & Horn Creek Rapid and attempted to make camp at Trinity Creek. It was occupied so we made our way back upriver to 91 mile creek for our “coziest” camp of the trip. 91 mile creek was a fairly small spit of land and we were basically living sardine style…pretty much shoulder to shoulder. The hour was late so we made quick work of some pork chops and called it a night. This day started much like the three before it. Much learning and many new experiences would be had before its end. Salt Creek rapid got our blood moving early…followed quickly by Granite, then on to the only two rapids that are named for a single individual, Louis Boucher (Hermit of Grand Canyon). Hermit rapid was bad to the bone. After the initial drop into the rapid, there was a second larger drop. The wave forming at the tail end of the drop was a huge, vertical wall of water. Just before impact, I witnessed two whirlpools forming in the vertical face of the wave. It was quite awesome and it hit us like a ton of bricks. We had a little over a mile to recover before Boucher. According to our guidebook, Boucher was only “half” the rapid Hermit was. Those rapids are strange beasts though. Three things come into play to determine a rapids general characteristic; water depth, canyon width, and drop. This is the metric used to “grade” rapids for the purpose of guidebooks, etc… There are a couple of other things that determine your individual experience with a rapid on that given day…timing and steering. Let me explain. In some rapids, the guide has a certain amount of discretion in his/her chosen path (in some rapids there is only one “safe” way through and others are just going to pull you in and have their way with you). There is sometimes a “wet” path and a “dry” path through a rapid. There is sometimes a “wet” side and a “dry” side of the boat. These are all things that are contingent on steering. The other component is timing. This water isn’t a consistent steady flow of choppy water heading to where it calms down. Some of the rapids actually have waves breaking in them much like the beach/ocean. If your timing is such that the big waves have broken, you might (as we often did) leave a rapid wondering why its “grade” was so high. If, however, your timing is such that the waves are at or near breaking as you hit them you’ll have a completely different impression. This is the only explanation I can give for what happened at Boucher. Bailey, for the most part, rode with his back against the “bathtub”…which is basically the center storage area of the main raft. For Boucher, however, he elected to ride the side tube with me. He took the position just behind me. The second or third wave in the rapid hit us exceptionally hard. I looked back and to my right and saw Bailey sandwiched between the main raft and side tube. We were still heavily engaged in the rapid so I reached down and tried to pull him back into position. No luck. I looked directly down to my right and saw that his foot was corkscrewed in the d-rings that hold the side tube to the main raft. I pulled right at his ankle and dislodged his foot leaving his shoe behind. Knowing that the next time the boat flexed his shoe would be lost I held onto it until it broke free. He quickly got back into position behind me and rode the rapid out. Once we cleared the whitewater, Bailey moved back to the inner rail and said that his ankle was really hurting. I also noticed his sunglasses were missing.The water knocked them off and we found them mangled in the channel between the side tube and raft also. The tendon above his ankle was already bruised and a little swollen. I helped him back to the tearoom and got him settled. Don chipped some ice off a block and bagged it up for him to put on his ankle. Bailey rode out Crystal, Tuna, Lower Tuna, the jewels (Sapphire, Turquoise, and Ruby), and Serpentine in the tearoom. We stopped at mid-day and about half the group left for a long hike. We hung out, ate lunch, and played cards. By time we loaded up to continue down river the ankle was feeling a little better. 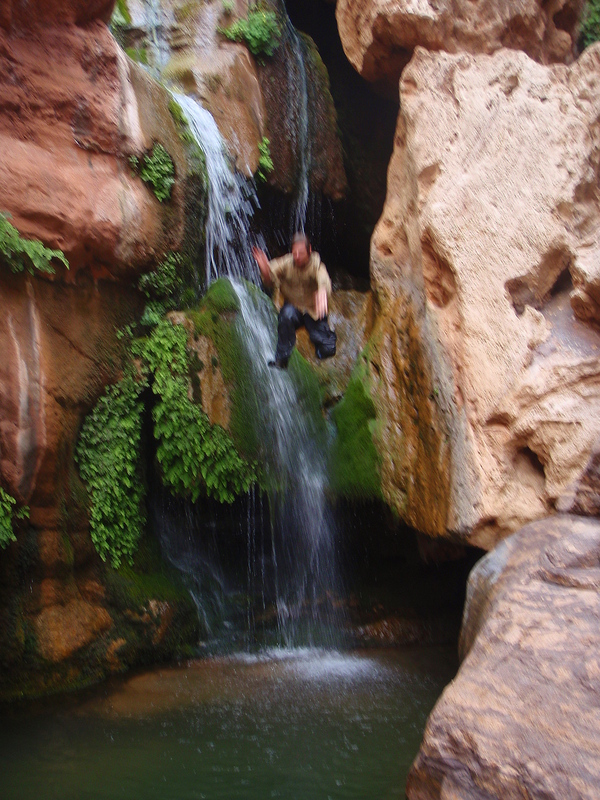 We rode soft water for a couple of hours to Elves Chasm…a cool little waterfall that you can climb up into and jump down. By this time, Bailey’s ankle is pretty much back to normal (at least enough to make the short hike to Elves, climb up, and jump down a few times). Another few miles down the river and we dock for the evening at Blacktail Canyon. We had just finished the duffel line when the wind came whipping down the canyon at probably 30+ mph. Thunder, lightning, more wind, and a mini sand storm blew through for about 45 minutes. The camp was pretty much in disarray trying to keep tents and chairs from blowing away. The guides boiled up some water (during the storm) so that everyone could have hot chocolate…we spiked ours with a little rum to calm the nerves. It worked. We had a late dinner of spaghetti and meatballs, shook out our tent, and hit the sack. Day 4 drew to a much needed end. When you cover 19 miles in one day (and you need to cover a total of 187 over six) you have to make it up somewhere. With only one day to go…somewhere would be tomorrow! Today brought with it a few nice rapids and a GREAT long hike. Specter, Bedrock, and Dubendorff were memorable but the hike to Dutton Spring was definitely the highlight of the day. The spring is about an hour and a half from the river up Deer Creek. Drawn by the “patio” and the “throne room” (not to mention a spring you can drink directly from) Bailey and I headed up and out. We started with a steep climb, traversed two narrow cliff ledges, meandered up the creek, and finished with a final steep climb. The water tasted just as sweet as advertised so I filled my camelback to the brim before making the return hike. As day 5 came to an end we pulled into what I think was Fishtail Canyon. We had a Mexican Fiesta for dinner that night. We also invented a game called RockKnockers. 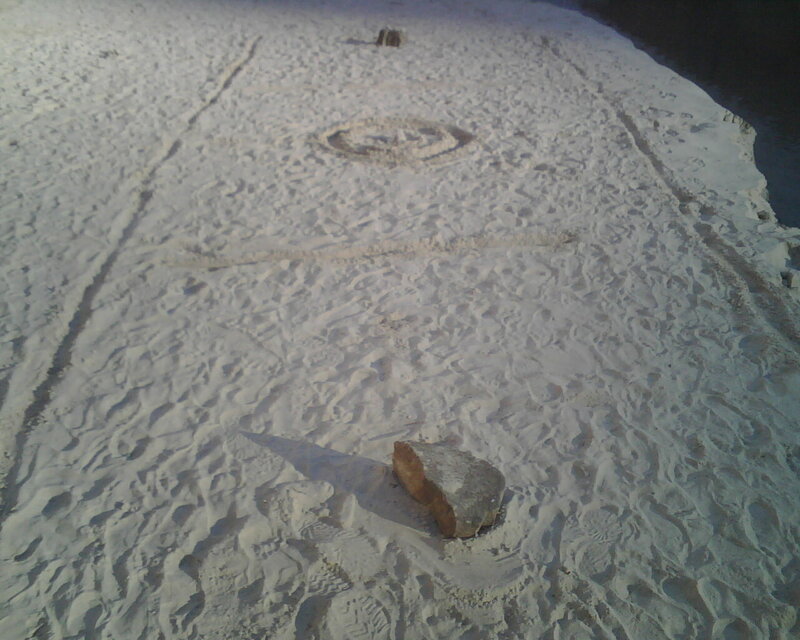 It is basically like horseshoes only played with big rocks and small rocks on a game table drawn in the sand. No strong wind, no busted ankles, just good times. 48 river miles is a bunch…no, it’s a WHOLE bunch! 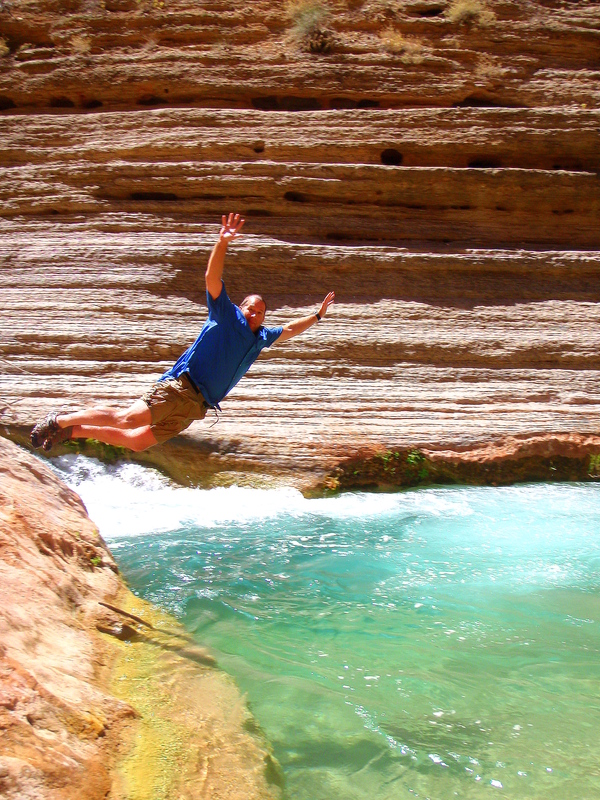 Despite needing to cover a lot of ground, we needed to make time for a hike up Havasu Creek. Jeff (trip leader) decided it would be a good idea to go ahead and make our lunches right after breakfast. We packed them in our daypacks and saved the time (an hour or so) of preparing them later. It worked out pretty well and afforded us the ability to motor hard to Havasu Creek, hike up there, and lounge around for a while. I swam and ate…Bailey ate and napped. After Havasu, all discussion turned to Lava Falls (aka Vulcan). Lava is the fastest navigable whitewater in North America. I couldn’t confirm this but I did find some wild videos on YouTube while trying. Just google “Lava Falls” and you’ll find plenty. The video below is one we shot of our sister boat coming through just after us…the second is our boat going through Lower Lava. The big rise and fall about half way through the rapid was definitely the high point. The water is fast and mean…and I came away with a deeper respect and admiration for the guides and what they’re able to do with their boats. We motored hard for the last 8 miles of our trip and docked at the helipad for the night. After an excellent dinner of Halibut we sat around, as a group, and listened as Jeff recounted our experiences of the last 6 days…and a little about what they do from here in regards to getting the boats back to the starting point. In a nutshell…they drop off the side tubes, throw on a second motor, and hammer down 120 miles in a day and half to the pull out. 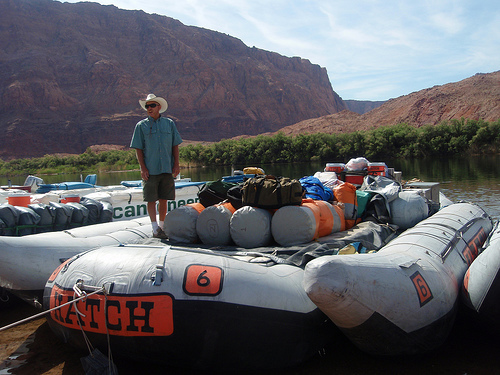 They then deflate the raft, pack it all into the aluminum super structure, and load it on a semi for the run back to Marble Canyon. Scenery and life experience aside, what makes most trips worth taking are the people you meet along the way. Watching Bailey interact with our fellow travelers was a great experience for me. It provided, I think, a window in to how he’ll handle the “real world” once he’s left the nest his mom has so lovingly created for him. Each and every person on this trip added a layer to the experience…and I can say with certainty that it was “all good”.